Specialty Trophy & Awards is pleased to offer custom designed and made awards. Our Specialty Custom Made Awards are designed to your specifications and we can pretty much create anything to your needs. We can make custom awards to fit the needs of your business, group, or organization. Tell us what you are looking for and we will work with you to make it happen. We can implement our experience and your ideas and try to turn your vision into a reality. Throughout the Custom Award process, we have laser cut acrylic and hardboard into various shapes for uniquely designed awards. We have even made clocks out of small tires. There is not any idea too big or too small that we cannot handle. Specialty Trophy & Awards is also pleased to be able to create Custom Made Awards for several MX racing event promoting clubs in the WNYOA Series. These includes Twisted Fence @ Sand Hill, Cross Country Customs, Conover Racing, and many more. You can contact us online by filling out a Quote Request Form with the specifics of your needs and we will gladly get back to you with some prices and information. We can laser cut clear acrylic into custom shapes and place it in a base with white led lights. When illuminated, the laser engraved area lights up. These work great for awards but, can also be used to make custom night lights, business signs, and bar signs. This lighted acrylic award, that was custom made for Saints-2-Sinnners, highlights the laser engraving from the red lighted base. This is a laser cut acrylic in the shape of a sprocket. The blue lighted base has a convenient on and off switch and is battery operated. The lighted base acrylics can easily be interchanged with other styles of bases and different colored lights. 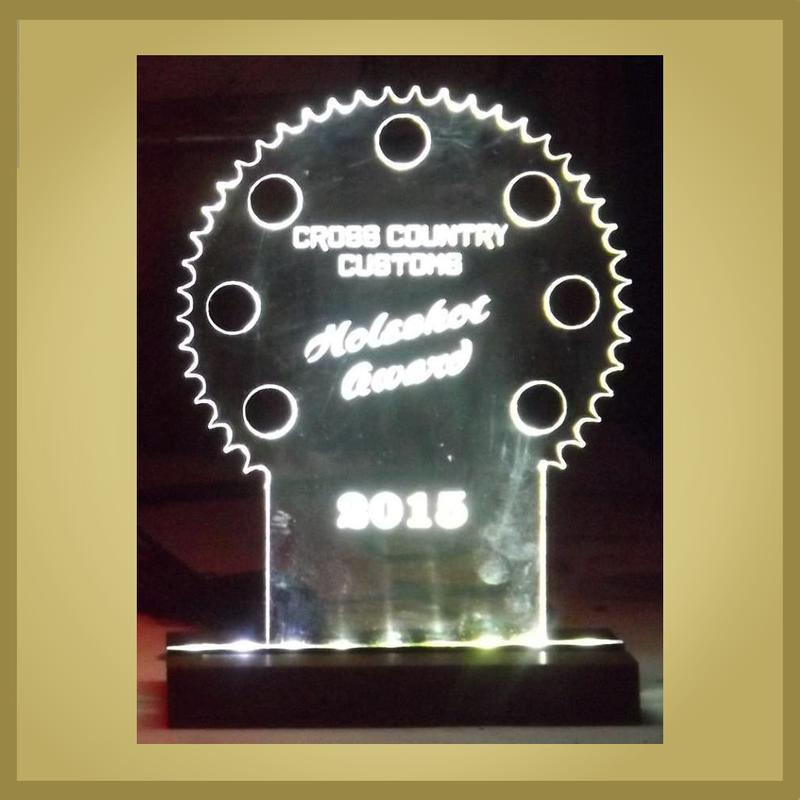 This lighted acrylic award features 9 red LED lights on a low profile base. We can laser cut hardboard into any shape with dimensions remaining under 10.5" x 14". The custom cut shapes can then be customized with full color images and designs. These can be used for a variety of uses such as poster boards, one sided or two sided custom plaques, signs, or uniquely shaped awards. The two-sided hardboard designs can also be used as dry erase boards on one side. These make perfect pitboards that can have your event information on one side and a useful actaul pitboard on the other. These full color racing pit boards can be easily customized with all of your event details and we can also design it for you. This design, custom cut out of hardboard, is a racing helmet shape with a sublimated full color design imprinted onto it. Here is a perfect example of a 14" poster board that can be used for anything besides just awards. The Specialty Design Team has come up with some truly unique designs for our customers. The Twisted Fence at Sand Hill awards were all made using actual fence posts for the base, and a custom cut hardboard for the topper. The Team cut and prepared the posts, and then laser engraved right into the wood. We can turn almost any item into a functioning clock award. They can be created from plaques, custom cut hardboard, cut acrylic, or even a tire. Using a sublimation imprinting method, we can turn any design or image into custom made plaques that can either be hung on the wall or displayed on a stand. Plaques can also have figures, emblems, or inserts mounted on them along with customized plates. This custom designed plaque features a sublimated plate (color image) mounted on a matte black plaque.